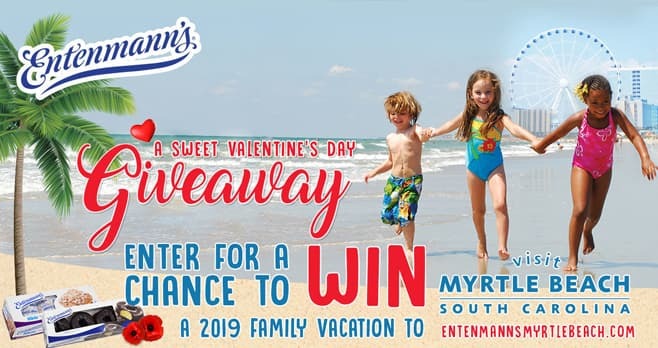 Just in time for Valentine’s Day, visit entenmannsmyrtlebeach.com and enter Entenmann’s Visit Myrtle Beach Sweepstakes for your chance to win a 2019 family vacation Myrtle Beach, SC. The Entenmann’s Visit Myrtle Beach Sweepstakes is open to legal residents of the United States and the District of Columbia who are 21 years of age or older as of date of entry. The Sweepstakes begins on January 17, 2019 at 8:00 a.m. ET and ends on February 14, 2019 at 11:59 p.m. ET. You may only use one (1) email address to enter the Sweepstakes. The grand prize consists of a trip that includes three (3) nights, four (4) days oceanfront hotel accommodations for themselves and up to three (3) guests (one (1) adult guest and two (2) minor guests up to a total of four (4) people) in Myrtle Beach, SC. Visit entenmannsmyrtlebeach.com to enter and see Official Rules for details. My mother loves these cakes.